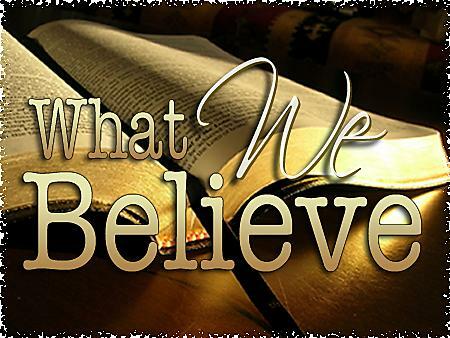 What we believe is vitally important because beliefs determine behavior and ultimately influence where we will spend eternity. The following is a shortened version of CCBC’s doctrinal statement as outlined in its foundational documents. 1. We believe the Holy Bible is truth without any admixture of error. We believe the Holy Bible was given by inspiration, kept through preservation, and is available through translation. 2. We believe there is only one living and true God who is inexpressibly glorious in his holiness , and that the Godhead is in fact three persons, Father, Son and Holy Spirit. 3. We believe Jesus Christ is God incarnate, born of the virgin Mary, lived a sinless life, died for our sins, and rose bodily from the grave victorious over death, sin, and the devil. We believe he will return to set up his kingdom on earth at the end of the Tribulation Period. 4. We believe the Holy Spirit is a divine person, equal with God the Father and God the Son. He was active in creation, restrains the Evil One, and convicts, saves, seals, guides, and sanctifies all true who trust Christ as Savior. 5. We believe Satan is a real person who through pride rebelled against God and is the malignant prince of the power of the air. He is the enemy of God, the accuser of the saints, and the author of all false religions. 6. We believe in the Genesis account of Creation in six literal days, and that man was created in the image of God and was given dominion over the earth. 7. We believe man was created in innocence, but by voluntary transgression fell from his sinless and happy state. In consequence, all men are sinners by choice and are under just condemnation. 8. We believe in the virgin birth of Jesus Christ through Mary. He is both the Son of God and God the Son. 9. We believe in Christ’s atonement for sin as he voluntarily substituted himself in the sinner’s place, bore his penalty upon the cross, the just dying for the unjust, and became our suitable, all-sufficient Savior. 10. We believe that by God’s grace salvation has been made available to all men everywhere through the death of Jesus Christ. All who believe and trust in Christ as Savior alone are cleansed from their sins and are made the children of God with a home in heaven. 11. We believe the church was founded by Jesus Christ and that it is composed of baptized believers covenanted together for fellowship, observing of the ordinances, the proclamation of the Word of God, and the carrying of the gospel message to the ends of the earth. 12. We believe that baptism by immersion and the Lord’s Supper are solemn ordinances given to the church by Jesus Christ. 13. We believe in the eternal security of all believers and that they future estate is based on Christ’s ability to keep them secure rather than on their own goodness. 14. We believe there is a radical difference between the righteous and the wicked. All who continue in impenitence and unbelief faced certain judgment before God and eternal condemnation. 15. We believe civil government is of divine appointment for the interests and good order of society. Magistrates are to be prayed for, honored and obeyed except in things contrary to the Word of God and the will of our Savior, the only Lord of the conscience. 16. We believe in the Second Coming of Jesus Christ when prior to the Tribulation Period he comes to rapture his saints out of the world. Seven years later he will turn with his to set up his kingdom on earth. 17. We believe our Lord commissioned the NT church to go into all the world to “make disciples” from all people groups. 18. We believe God’s method of financing his earthly work is through the tithes and offerings of his people freely given without compulsion, for God loves a cheerful giver. A fuller, more detailed Statement of Faith is available upon request.